The use of reversed-phase ion-interaction high-performance liquid chromatography is reported for process monitoring of cyanide, thiocyanate and metallo–cyanide species in the gold cyanidation process. Thiocyanate and the metallo–cyanide complexes were monitored with a programmable, variable-wavelength UV detector mounted directly after the column, while cyanide, thiocyanate and the Cu(I) and Ag(I) cyanide complexes were monitored with a post-column reaction (PCR) detection system mounted after the UV detector. The eluent composition was optimised to enable separation of the major components of process samples in less than 10 min on a 5 cm column, but a 15 cm column was required for samples that contained Cu(I) at concentrations in excess of 300 ppm. The major emphasis during development of the eluent was to provide baseline resolution of thiocyanate and the Cu(I)–cyanide peaks and the optimal eluent composition consisted of 25% acetonitrile, 10 mM tetrabutylammonium hydroxide, 10 mM KH2PO4, 5 mM H2SO4 and 80–160 μM NaCN, adjusted to pH 8.0. The level of cyanide present in the eluent was determined by the degree of separation required between thiocyanate and Cu(I). The PCR detection system enabled the cyanide:copper molar ratio, R, in process samples to be monitored routinely. R was determined from the peak area ratio of the cyanide and Cu(I)–cyanide peaks. The use of the peak ratio eliminated drift in the PCR detection system, providing a stable calibration for R. Good agreement was observed between standard analytical methods and the chromatographic method for determining R. Controlled cyanide leach tests showed that all the cyanide in the samples could be accounted for by the various cyano species detected. 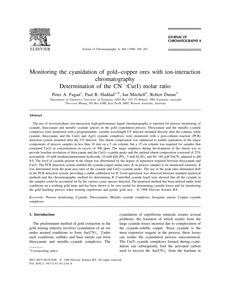 The proposed method has been utilised under field conditions on a working gold mine and has been shown to be very useful for determining cyanide losses and for monitoring the gold leaching process when treating cupriferous and pyritic gold ores.